P. coriacea is a species which grows in the mountains in both the south of Spain (Sierra Nevada) and Morocco (the Rif and Mid-Atlas). Not too much information can be found, it is difficult to obtain and grow and has only once been used in any hybridizing effort as far as we know. It is characterised by its leathery foliage (coriaceous), and is a tetraploid. It naturally grows in a Mediterranean climate, which is characterised by a hot and dry summer (Köppen-Geiger climate classification Csa with C=warm temperate, s=summer dry and a=hot summer). As it grows at higher altitudes it may be accustomed to somewhat milder summer temperatures, but rainfall will be very sparse there in summer as well, although both the Rif and Mid-Atlas are situated north of the higher Atlas mountains, close to the Mediterranean Sea, and are thus spared from the extreme drought the Sahara desert would bring. 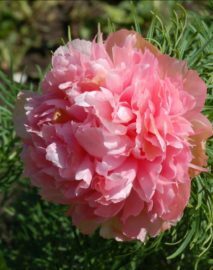 “In the spring of 1928 I made a trip to Ottawa, Canada, where there is a large collection of peony species. I wonder when anyone else has made as long a trip for the sole purpose of gathering some pollen grains. At any rate I brought home with me a number of different pollens gathered from plants that were then in bloom. 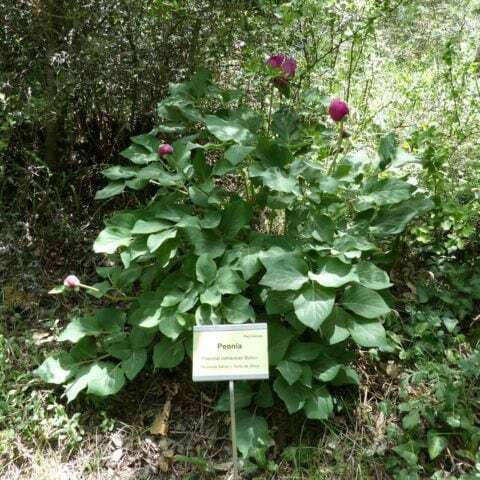 Among these was the species P. coriacea which is native to Portugal and the mountains of Morocco. 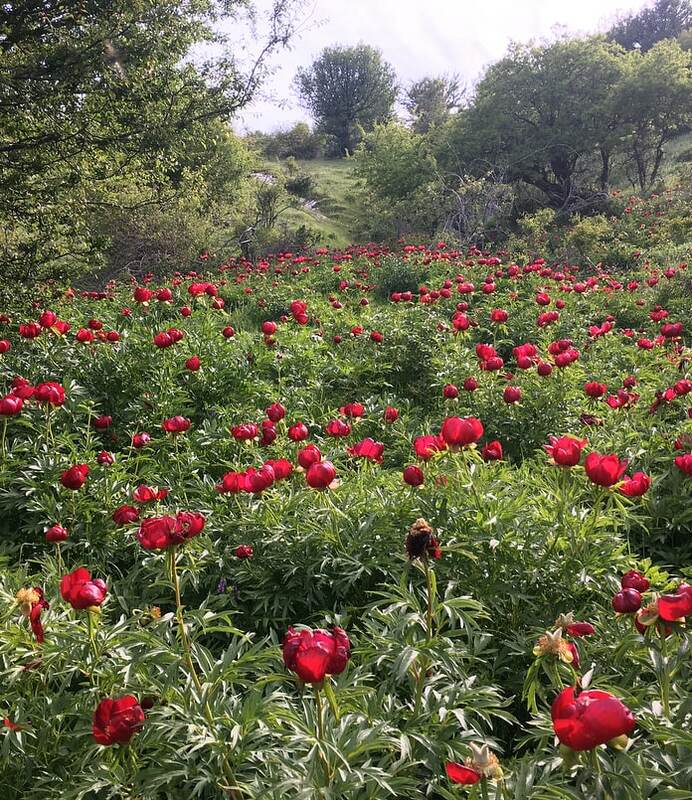 I made a good many crosses with coriacea pollen on Chinese peonies [P. lactiflora, kh] and a few on officinalis (the old double crimson) [P. officinalis Rubra Plena, kh]. 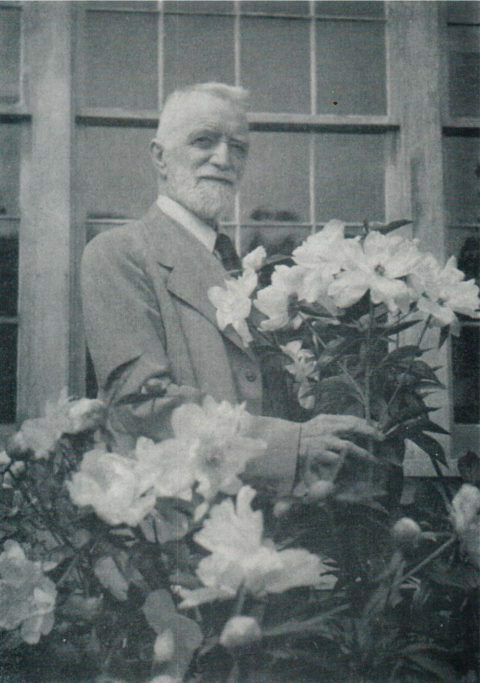 Then I waited for five years and in 1933 and 1934 about ten of the hybrid plants came into bloom. They were all much alike; all single, sterile, and they all gave flowers of a lovely lavender color. They are somewhat reddish at first, but the color soon changes into a clearer and lighter shade and the red goes out of it. Who could have predicted that these clear lavender flowers would come out of a cross between a purple red and apparently no matter what in the way of a Chinese peony? This race of coriacea hybrids is highly sterile. I do get a seed once in a long while, but from the few seeds I have had in ten years there are so far no germinations. 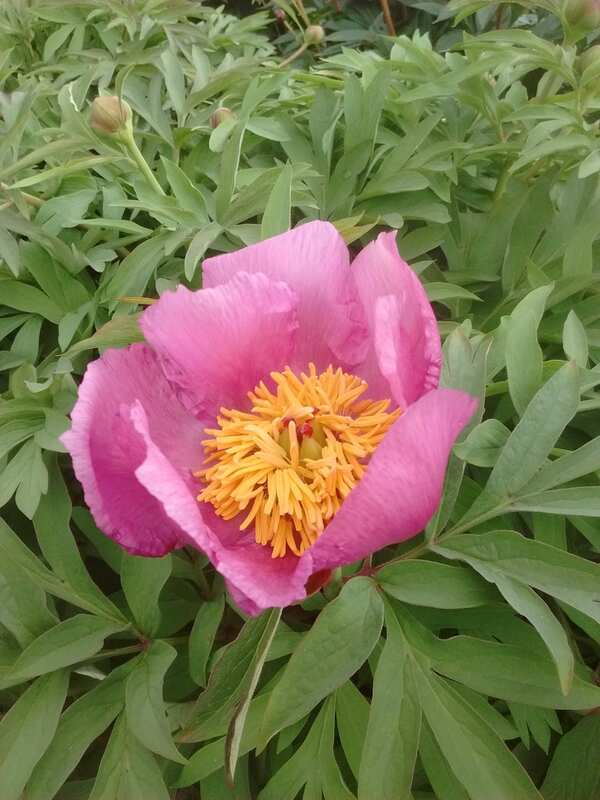 It has to be remembered that peony seeds are in no hurry to germinate. They sometimes come up the spring after they are planted in the autumn, but more often they do not make their appearance until the second spring. It should likely to be poor things with perhaps no vitality in them. 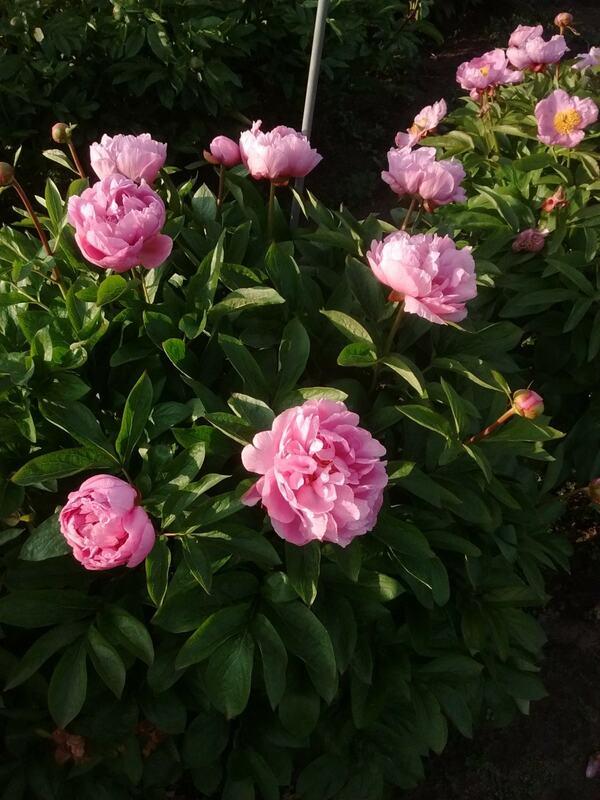 I should very much like to have some F2 plants out of this cross, for these hybrids represent a break in the conventional color scheme of the peony and if such plants turned out to be fertile they ought to give interesting outcrosses on officinalis, macrophylla, and other species. Reportedly Valkyrie does have Eclipse in its ancestral background: Blushing Princess x (Sable x Eclipse). The best of the P. lactiflora x P. coriacea seedlings were introduced into commerce as the Lavender strain (all triploid). Thus originally it wasn’t a single plant that was chosen and named, but several different plants, although with the same parentage and very much alike, that were all sold as Lavender. 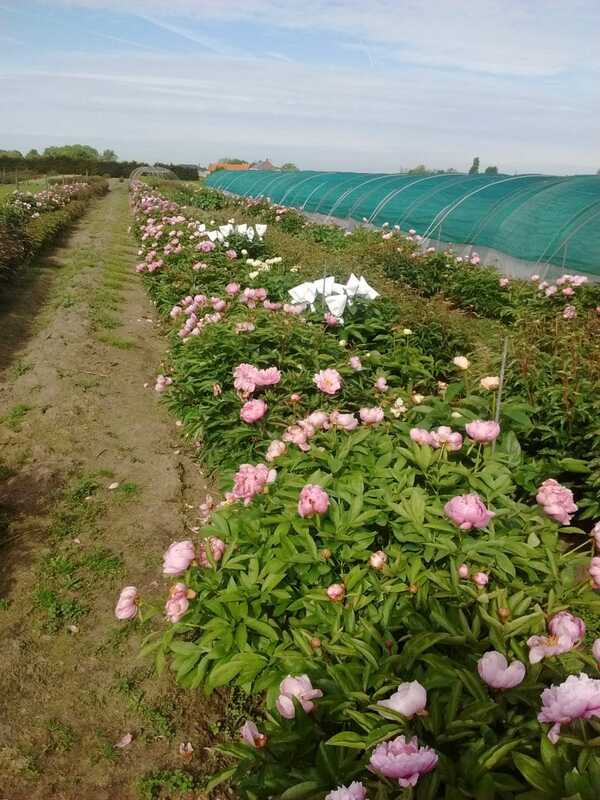 As these plants are not the easiest ones to grow, it is quite likely that over such a long time only the best grower(s) of these is/are still being grown from a few specialized nurseries. I once grew one, a very nice division obtained from Don Hollingsworth’s nursery, but unfortunately it died after a few years. Although A.P. 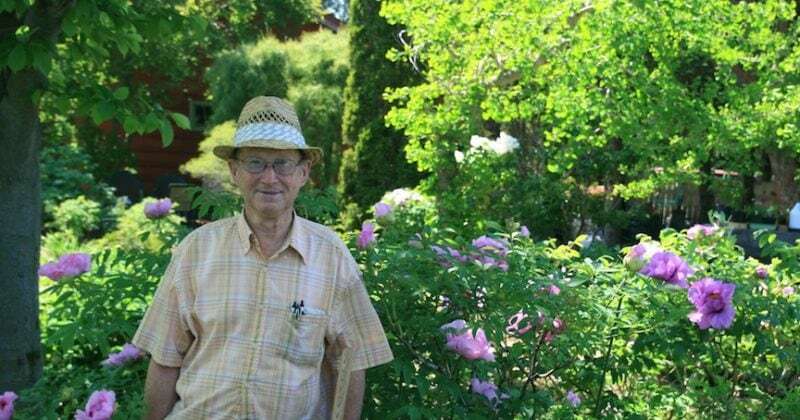 Saunders had his first blooms in the early 1930s and stated his interest in obtaining offspring from it, it took a very long time, 70 years, before a rare seed finally germinated at the other side of the ocean. Ruud Warmerdam, in the Netherlands, noticed a seed on a plant of Lavender in 2002, thus open pollinated. This was probably the first seed from it to germinate and grow. It flowered for the first time in 2006 and he offered the first plants in 2009, it was registered in 2013 as Lavender Baby. A first year plant of Lavender Baby in front of a larger Lavender. The foliage being completely different. 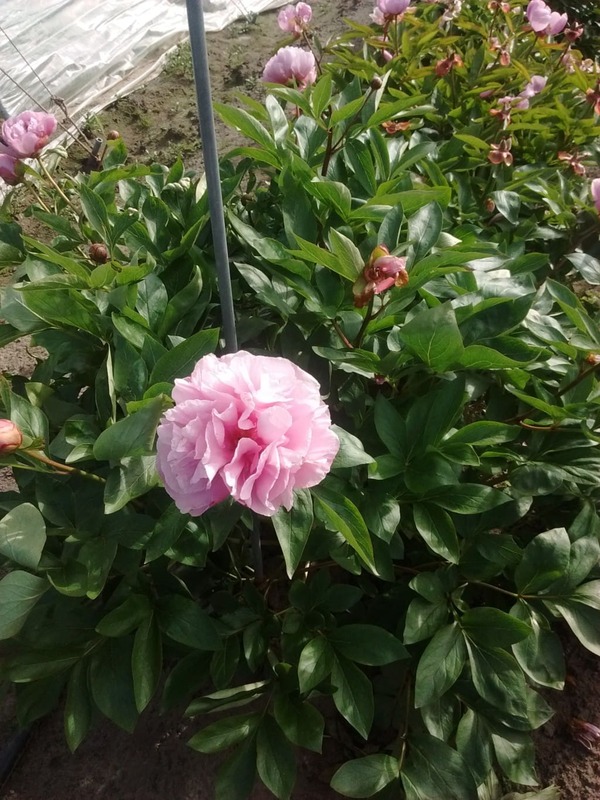 Now Lavender Baby is a plant you could easily spot from a distance in a field of other peonies. The foliage is very different. 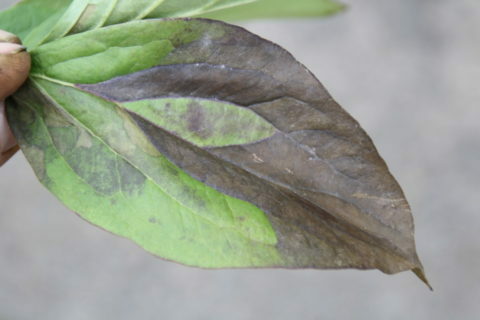 Deeply dissected and grey-green of color. 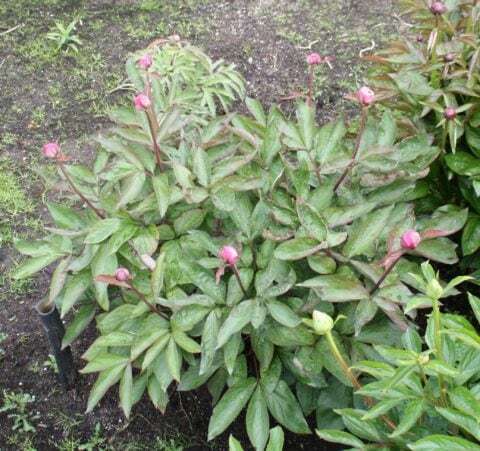 The foliage is very dense, it is very floriferous and, unlike its mother, very easy to grow and propagate. It is rather short, never more than 50-60 cm in height here. The foliage makes it a good garden plant, but the flowers are not particularly attractive to my eyes. Small, dark pink, sometimes a bit irregularly formed on somewhat spreading stems. By sheer luck I was one of the first customers and obtained it in 2009. In 2011 it flowered here and, expecting low fertility as it was related to Lavender, I used its pollen on some 40 flowers of Pink Vanguard. It turned out to be very fertile as I got some 15 seeds on average for every flower pollinated, thus over 600 seeds. They germinated extremely well, nearly 100%. A bit of reading, which I hadn’t done at the time, might have predicted this as Saunders had already noticed that rather infertile F1’s that give the occasional seed, tend to result in F2’s with fully restored fertility. Now I have grown these seedlings into some 350-400 mature plants (some were culled along the way, others were weaklings, some were lost due to careless treatment). 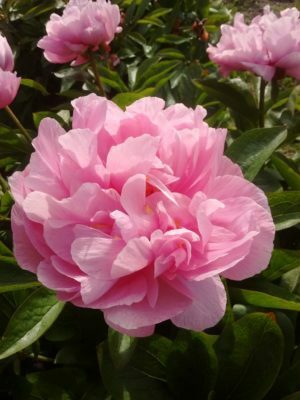 Most have grown quite well and I had them in flower several times. From the first to the last, they are all shades of pink. ((But for one exception, which is yellowish and surely the result of a contaminated cross, it doesn’t resemble the other seedlings.)) 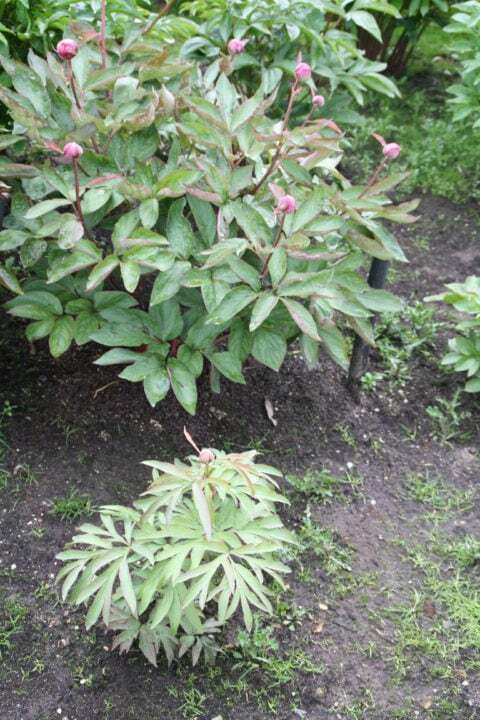 Most are worthless of course, a lot of them with weak stems, some with ugly open foliage, many with very small buds and flowers. Unfortunately none has the foliage of Lavender Baby. If I compare a random 50 plants of this cross with a random 50 plants of a cross with more advanced hybrids on both sides, it is clear that on average the resulting plants are only mediocre. I had used Lavender Baby pollen also on Blushing Princess and Salmon Dream. This resulted in fewer seeds, simply because I did not have as many flowers of these. The seedlings from Salmon Dream all grew into ugly and weak plants. Blushing Princess’ children were on average far better than Pink Vanguard’s children with the same father. But in the end, the best plants were from Pink Vanguard x Lavender Baby as I had ten times as much plants to choose from. Most of these plants are fertile and their seeds are already being grown on. Currently I’m propagating a few selections. 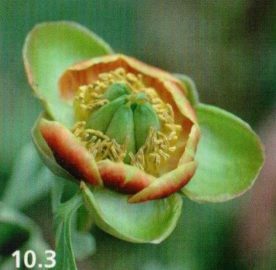 Some are merely for use in further hybridizing, but there are three candidates for future registration and introduction. I’ve given them provisional names to easily refer to them. “CF001” (for cutting flower 001) is a semi-double to double, quite early and tall. Average bud size, floriferous. It is somewhat spreading, thus not particularly suited for gardens. “Kato 001” (my daughter’s name is Kato) is a semi-double to double with strong upright stems. 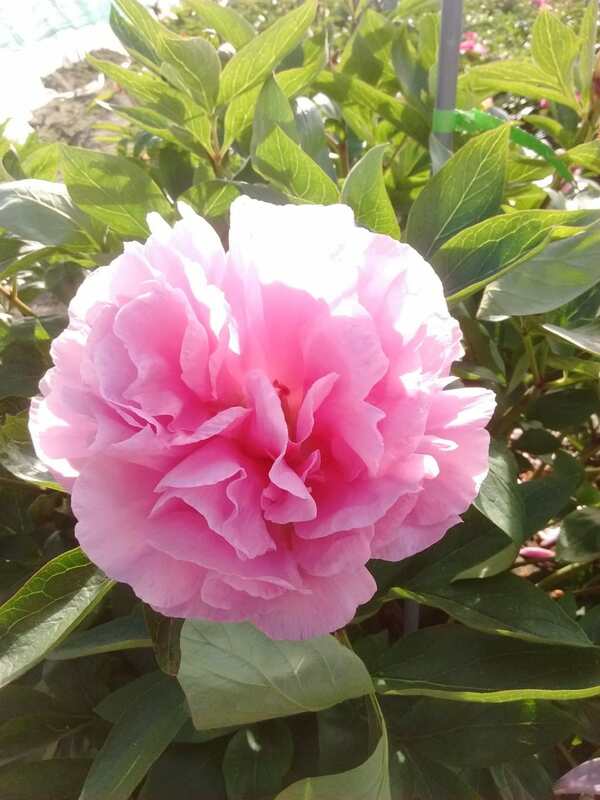 Large flower and good bud size, average length, good fragrance. 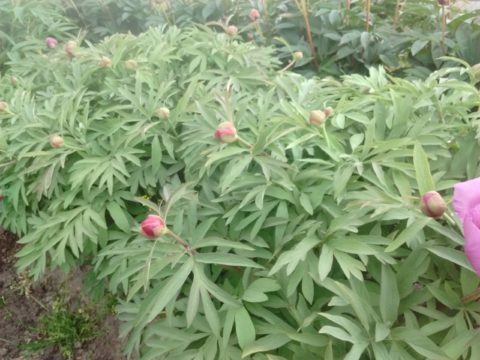 Its buds froze last year due to an exceptionally late frost (the same could be seen on Pink Vanguard). “Kato 002” is also a semi-double to double with strong upright stems. It is as yet unclear which is the best one, Kato 001 or Kato 002, but both are excellent garden subjects. For cutflowers they might be somewhat short. 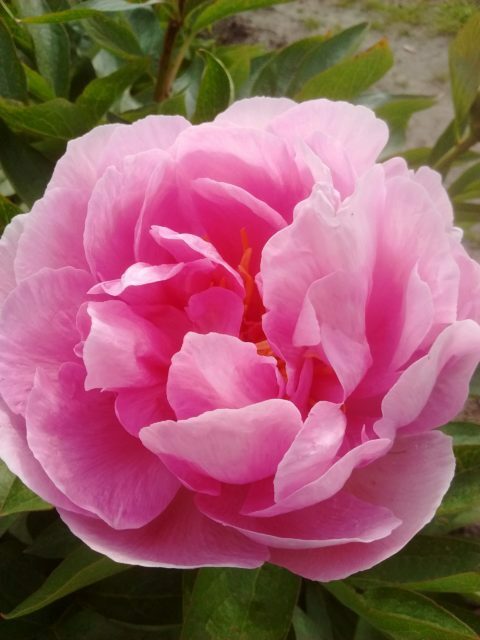 They flower very early and with their excellent bush habit, I consider them welcome additions for most peony gardens. If you have some experiences with any of the above plants, feel free to place a comment and share your story! Now for something very new and distinct: double pink paeonia tenuifolia cultivars. The hybridizers newsletter, published from 1970 through 2002, is now (nearly) fully available. 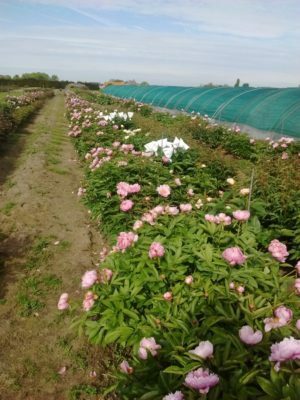 Growing peonies for cutflowers in Belgium. Also hybridizing them. This is a great article Koen. 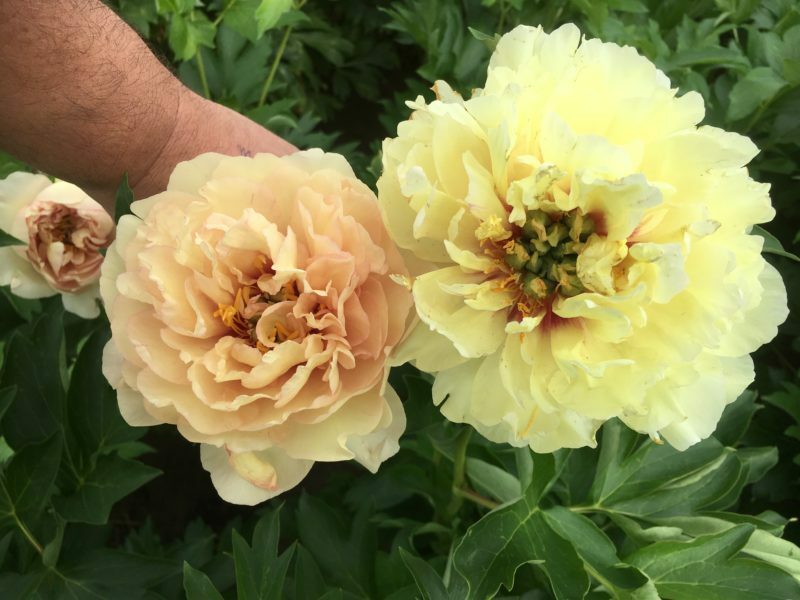 It’s always educational to hear about other’s hybridizing results. But in the end it can be as you said in your quote : More than the public may realize, rather than intrinsically being a matter of cleverness, hybridizing is often a numbers game. We see a wonderful registered result from a cross, but we don’t see all of the others from that very same cross that were duds. Growing many seedlings from the same cross may be the brute-force method it’s true, but that’s often what it takes to get a pleasing result.